Are Submerged Plants A Good Idea For Your Water Garden? Home > Blog > Aquatic Plants > Are Submerged Plants A Good Idea For Your Water Garden? Many pond owners are fascinated with submerged plants and the role they play in the ecosystem. They include plants such as hyacinths and water lilies, and come in a rich variety of color and texture. Aside from this, subsurface plants can bring tremendous benefits to your pond. Even in a backyard pond fish are vulnerable to predators. Birds, cats, raccoons and other animals will be attracted to the pond and they are clever enough to figure out ways to get the fish out of the water and into their stomachs. One way to prevent this is through sub-surface plants like Red Stemmed Parrots Feather. Not only can the fish use these plants as a shield when predators are present, but it can also provide camouflage. Red Stemmed Parrot is a type of aquatic herbaceous plant whose name is taken from its greyish green leaves with their feathery appearance. It is diverse and can be used as a floating plant as well as underwater plant and has lush green leaves which will provide shade to the pond in addition to hiding the fish. It is popular especially with goldfish and koi and due to its ability to grow in wet soil it is popular near streams and waterfalls. These plants are sometimes referred to as oxygenators, and there is a good reason for this. They produce oxygen naturally as part of the photosynthesis process; and oxygen is one of the most important components to a thriving pond. When sub-surface plants such as the Red Ludwigia is used in conjunction with a high quality aeration system as well as regular pond maintenance, you will have much cleaner water which will go a long ways to support healthy fish. Plants such as Red Ludwigia are beautiful in color and will grow rapidly. They have greenish red leaves which may sometimes extend from the water, and the more light they’re exposed to, the darker the red coloring will be. Underwater plants provide roots, stems and leaves which give your fish safe spots to lay their eggs. Once the fish hatch, these plants will protect them, while providing food sources and a comfortable place to rest. 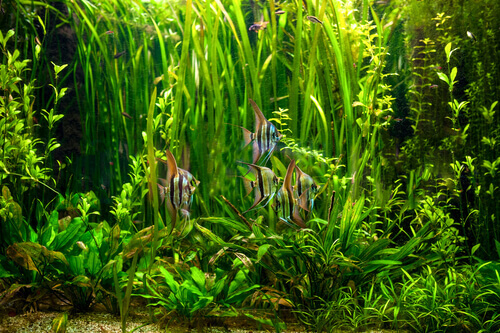 Vallisneria is one of the best plants for this purpose, as they produce green meadows below the surface and grow quickly. Vallisneria has green leaves which are long and ribbon like in appearance. It provides superb filtration and is an excellent oxygenator. Fish can also use it to hide from predators and it is pleasing to the eye. Another benefit of sub-surface plants is that they’re easy to handle. All you need to do is fill up planting baskets with oxygenators and other plant media, and then put the basket inside the pond at the bottom or on a shelf on the pond’s side wall. The baskets will cause the roots of the plants to extend outward and gain nourishment while preventing the fish from consuming the roots.